I currently work as a primary teacher for Highland Council. Before completing my PGDE I studied for a BA in Scottush Music at the Royal Conservatoire of Scotland in Glasgow. I am from a small village in the north west of Scotland called Achiltibuie and have been brought up in a musical family. 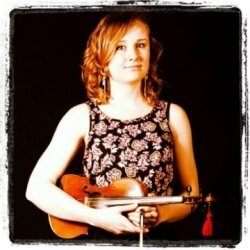 I was taught fiddle by Angus Grant senior for 11 years and also attended lessons with Patsy Reid for Classical violin tuition. I am a primary teacher but have taught fiddle since I was 14 and had a number of pupils individually and in groups. I have taught through the Fèis movement for Fèis Spè and Fèis na h-òige. I have experience of teaching both adults and children and Im happy to work with either. Any age and any level welcome! I am very patient and always open to suggestion and finding alternative ways of achieving goals should that be necessary. I'm willing to adapt to needs/ preferences of the pupil with regards to style (Scottish/ Folk/ Classical) and can teach with music and/or by ear. JoannaFrom Rebecca (5/5): Very happy with Tutor.